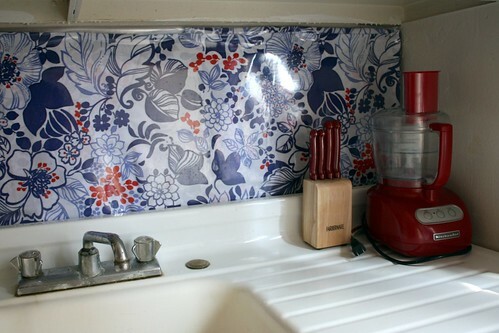 There's been much fuss over recreating the fabric backsplashes found in Ikea catalogs. But mounting plexiglass to a wall is not an option for us renters. Here's my cheap fix for imitating this effect. In hindsight, I should have been more careful folding & hanging, so I'll remember it for next time. 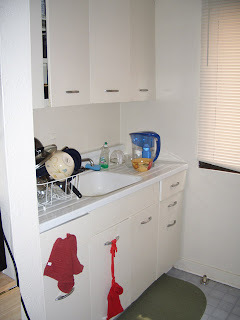 My kitchen under the previous renter. 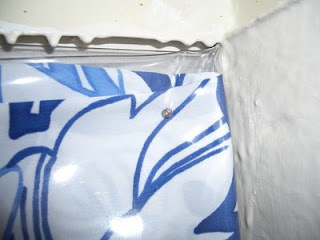 Step 6: Place vinyl+fabric onto wall, using wire nails at the top most point. You don't want the nails to be obvious. Thanks, Kris. It's already been 1.5 years, and the vinyl+fabric is holding up really well. 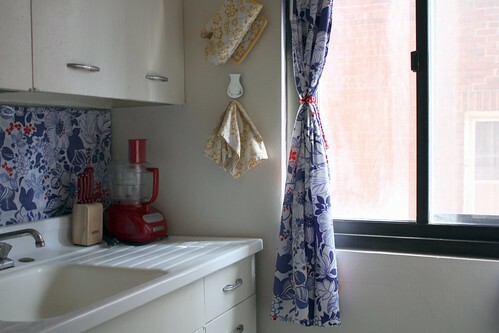 It's really great for adding pops of color to rental kitchens. where can i get that kind of vinyl? is it the self adhesive one? Amber's right, Anonymous. I bought this clear vinyl at a JoAnn Fabrics, so most large fabric stores should carry it. It comes on a large roll, somewhere near the home dec & utility fabrics. It is not self-adhesive, but you could possibly try that stuff?